About a month ago, I stumbled upon the Smitten Kitchen website while looking for a Russian dessert recipe. Since then, I have been back often and subscribe to her posts so I don’t miss a new recipe. I also purchased Deb’s cookbook, which came out last year. I usually don’t care much for lentils or chard. Having them both in a recipe made me a little apprehensive and I almost didn’t try it. This is the third recipe that I’ve actually tried from Deb and it’s really a winner! It has so much flavor (and good things for you in it) that my mouth was saying “More, more, more,” even though my stomach was saying “I’m so full!.” After two bowls, I put the rest in the refrigerator and now I can’t stop thinking about my lunch tomorrow! My husband, who loves lentils, practically inhaled his first bowl…then savored the second. He was a big fan of the garlic oil that included nice, golden brown, crispy slices of garlic (Deb was right….this is one thing you can’t omit). 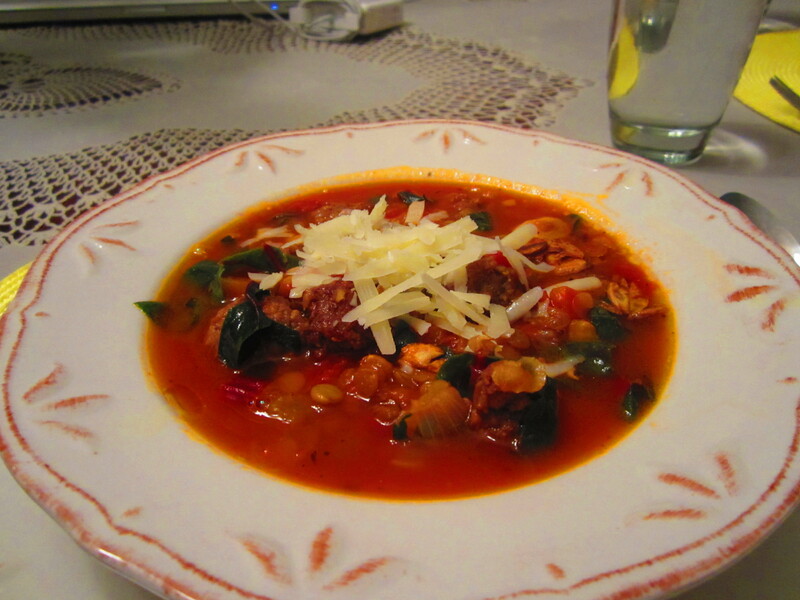 This soup can be made dairy-free (skip the cheese) or vegan (skip the cheese and sausage). Unlike Deb, I used a full package of Italian Sausage since I like lots of meat in my dishes. Note: I used a full package of sausage instead of half. I also let my garlic get a golden brown and crispy for the oil drizzle for each bowl…the crispy garlic was the best touch, according to my husband.